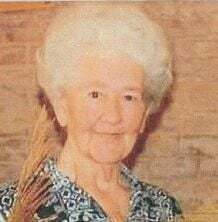 Betty Louise Ward Webb, age 82 of Avery TX was called home on Monday, February 18, 2019. Mrs. Webb was born September 4, 1936 in Jerome, ID to Eynon and Velda Summer Ward. She was of the Christian faith. She was preceded in death by her husband Kenneth Webb and brother Warren Ward and his wife Peggy. Funeral services were Wednesday, February 20, 2019 at the Spirit of Life Church in Boxelder TX. Betty is survived by two sons; Ken Webb (Audrey) of San Antonio, Steve Webb (Alice) of Tawakoni, two daughters; Jo Ella Bollar (Randy) of Nampa, ID and Denise Webb (Willie); one sister Vivien Volkers of Jerome, ID; one brother Wayne (Barbara) Ward of Elko, NV; 12 grandchildren, 12 great grandchildren and numberous nieces and nephews.